De Pong Game is a recycling of the famous game PONG [Atari 1975-1977]. This new version has been built with Flash [Action Script] by Arjan Westerdiep and Recyclism. This project explores the concept of Augmented Reality by using and interacting with urban architectures [buildings] as background for the game. 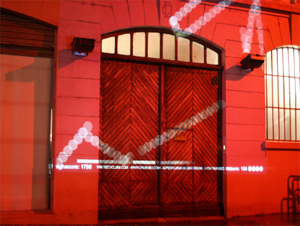 The game is projected on a building and the limits of that building become the limits of the game area. The ball projected on the building bounces along the limits of the walls. The software is also using the windows as an obstacles for the game. So the ball is limited to frame of the building. As you touch the ball with the slider, its speed increases and because the ball bounces on all the obstacles of the architecture it becomes more and more difficult to play.